When you're fishing your salmon fly in most fast moving streams there will be a certain amount of natural movement as the fly arcs around in a semi circle from it's initial casting angle starting point to the riverside edge below you. Salmon flies these days are tied mainly with buck tail or arctic fox that will react to varying degrees in the stream. Personally I like to take this to the next level and choose strictly the fly tying materials that offer the most attractive movement of all and even in the slowest moving salmon pools. I rarely will fish a buck tail fly these days and will always choose the much more mobile and attractive fox tail equivalent for the wing or tail material. You really want to be fishing a salmon fly at all times that appears to have a stream life of its own and my professional advise is not to ever compromise on this. For the flies hackles I'll choose the softer and longer schlappen hackles over regular hen hackles as what I'm always looking to create is an absolute 'live bait' of a salmon fly that even the most educated salmon in the pool just has to come off its lie to investigate. Anyone can catch the 'easy fish' and although always a challenge I get a much bigger thrill out of catching the old resident salmon that have seen it all before. 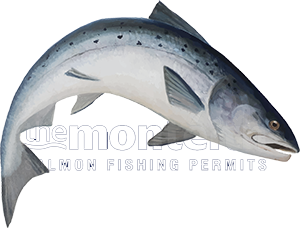 As salmon fishers we tend to carry around hundreds of salmon flies in our fishing bag but the reality of the situation is that you only need 2 or 3 to choose from for the vast majority of salmon fishing scenarios. This reminds me of my youth on the Tay when out with my mentor the late Willie Laird who only ever kept 2 or 3 flies in his tweed jacket and those flies caught hundreds of salmon each season. Tie you fly with the softer more mobile materials and before you use them test them at the side of the river and fish only ones that moves naturally and in a 'life like' manner. Don't worry about anything else and have faith in that natural waggle and movement you're looking out for when you see a fly that's performing perfectly. What you've now got is a deadly fly and if you stick with it you should see your 'subsurface cooperation' levels increase significantly.